By Crom! What am I up to in China? I’m hanging out and chatting with the folks at Nordic Trolls/Re-Roll Entertainment about the plethora of new projects coming up. There are some old Funcom faces here. One of them is Karl Andre Bertheussen. Karl and I were narrative partners-in-crime back in my Age of Conan days. Karl is a narrative designer, a game/gameplay designer of a more storyteller bent, so we always worked well together. We both play to each others’ strengths. Karl is good at coming up with the skeleton structure of a thing, and I’m good at growing all the visceral flesh on that skeleton. Karl was now Narative Designer. I was now Lead Writer. Our first big project, where we had narrative control, was The House of Crom. It was a dungeon planned long ago, but never fully implemented. It had some basic story, level design, and some assets. We were told to fix the story, using those assets. 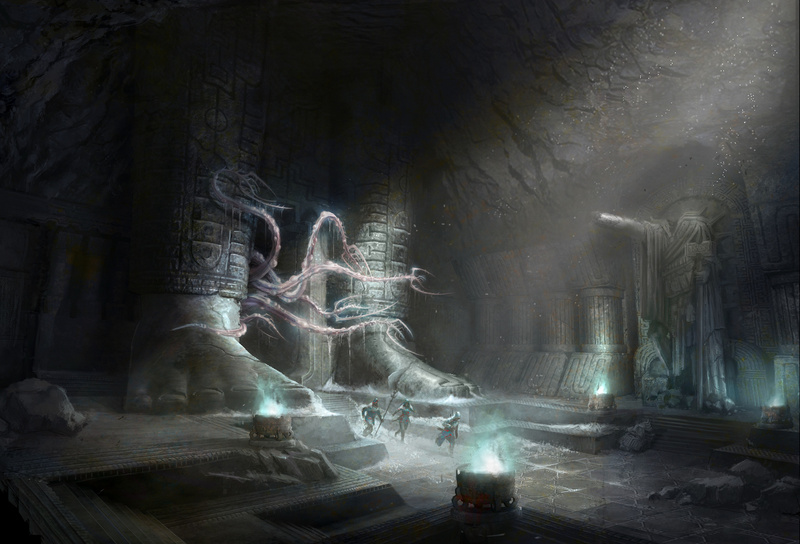 A spooky, ancient temple, in the mountains of Cimmeria, populated with the immortal remnants of the last Atlantean colony. There was a deathless, insane Atlantean queen. There was a partially finished, giant, tentacled worm monster as the mid-boss. And there was room for a not-yet-designed final boss. We wanted to tell a story featuring elements of Lovecraft’s Cthulhu Mythos. Lots of games emulate Lovecraft’s lore, but Robert E. Howard’s Hyborian Age actually occupies a particular Sword and Sorcery corner of the official Mythos. The Cimmerians don’t go to the House of Crom. They do not even pray to their god (he just gives them the strength to deal with a harsh world at birth). It makes sense, in Howard’s world, to have some Cimmerians point to a mysterious temple in the mountains and say, “Crom lives there.” But they would not visit. NO IMMORTAL ATLANTEANS. We had already done something similar with an extinct culture in Khitai. It just takes away from the tragedy of Atlantis’s fall. So, instead, they would be the ghostly and undead remains of the last colony, bound to the temple for some unholy reason. The sleeping, deathless queen was ok though…we just needed a compelling reason for that. The final boss would be an Outer God from the Mythos. Perhaps Yog-Sothoth. Players would summon and then battle an avatar of this entity through an intricate ritual (with clues scattered throughout the temple). …then perhaps the mid-boss (the tentacle worm monster) would be a Great Old One? With those thoughts, we mulled over possible scenarios. Something was missing. And then…I recalled “The Dunwich Horror” and I thought, What if the giant worm monster is the mad queen’s offspring? And then the rest of the pieces quickly fell into place. A grand tragedy. Call it Sword and Sanity. Non-linear storytelling, the player would just get fragments of the ancient events as they explored the horror-haunted ruins. That project ended up being one of the bits of work that I am most proud of from my time at Funcom. The gameplay and story text never felt so joined — from the clues to the grand ritual at the climax. After Karl and I got all those thoughts into place (after drinking much coffee), I wrote the following backstory that became the official pitch that we based the dungeon around — pulled, now, from my secret vaults. Enjoy! A devil from the Outer Dark,’ he grunted. ‘Oh, they’re nothing uncommon. They lurk as thick as fleas outside the belt of light which surrounds this world. I’ve heard the wise men of Zamora talk of them. Some find their way to Earth, but when the do they have to take on some earthly form and flesh of some sort. The thing cannot be described – there is no language for such abysms of shrieking and immemorial lunacy, such eldritch contradictions of all matter, force, and cosmic order. It was a time of hardship for the Atlanteans—suffering greater than anything they knew before or would know after. The seas rose and swallowed Atlantis, and the seagulls feasted for months on the rot and stink of bloated souls. The few survivors huddled in the colony on the mainland, upon a mountain that still rose above the deluge. But this sanctuary harbored its own perils. The Picts attacked in ceaseless onslaught. Slipping into barbarism, the remaining Atlanteans realized they risked loosing not only their lives, but their identities, culture, and memory. The Queen formed a desperate plan. Though their gods seemed to have abandoned them, the Queen contrived to construct a great temple to Valka, chief among the gods and creator of humankind. They would build it on the mountain, touching the sky, and the most learned priests would conduct ancient rituals while the people pray and plead. How could Valka not answer his children? The people believed in the Queen’s plan, for she was the most beloved, most pure—to look upon her or hear her voice was to banish all doubt. So the Queen, the priests, and a contingent of artisans left the colony behind. They toiled for years. Architects and stone-cutters built the temple, refined it, filled it with statues and wonders. Goldsmiths made endless idols to please Valka. The scholars studied and the priests performed rituals. And still, their god would not answer their cries. Why could they not please him? The Queen calmed her people, soothed their lamentations with her words, saying that at the next ritual, she would clime the ziggurat and call upon the divine directly. The people were pleased, for how could anyone, even the gods, ignore someone so pure, so good, so beautiful as the Queen? Her continence eased all pain. Her words banished all doubt. But the Queen carried a secret. Though she could protect the people from their doubts, there was no one to save her from her own. The sinking of Atlantis, the loss of her civilization, the suffering of her people had eroded her hope. She could not recall how many failed rituals it took, but at some point she realized Valka would not answer. It was all for nothing—leaving the rest of her people to die at the hands of the Picts, the years of hard toil to build the temple—all for nothing. They would all die and there would be no one to remember them. But how could she tell her people, who so loved and trusted her? So she told them pretty lies and kept them working, and the secret sat in her guts, gathered bile, turned to acid and spite, and ate away her sanity. That is when the Queen began praying to the whisper in the dark, the voice of something…Other—something aroused by the endless chanting of the priests who, in their desperation, used older and older rituals from before the time of any of the Thurian civilizations (perhaps before mankind). The night she climbed the ziggurat alone, the Queen contacted this being, one of the Outer Gods from beyond the Gulfs of Space and Wells of Night. She made a deal with the creature and felt the icy caress of tentacles reaching from across time and space as the primordial being impregnated her. She came down the steps; hair turned white, and told her people that she had been blessed by Valka with divine conception. She said that there was more work to be done, changes to make to the rituals, and that Valka would come to them to claim his child, and the Atlanteans would be saved. The people believed. They did not doubt their queen. It is easier to believe the lie that one so desperately wants to be true. And for nine months, they toiled on. She gave birth, in secret, in the Deep Cave. During the grotesque nativity, the midwife died of fright from the cries of the thing wrapped in swaddling. The Queen commanded a trusted adviser to seal her child in the Deep Cave, with five handmaidens to “nurse” the babe. When this was accomplished, she sealed the adviser, the only one to know the truth, in the treasury, with the key to the Deep Cave, to be guarded by magical stone sentinels who would let none pass but her. And that night, she climbed the ziggurat, holding a false bundle of swaddling, and the people cheered for they would finally see the face of their god. The hardships would at last be worthwhile. They conducted the new ritual, and the Outer God came into the House of Valka. The people had just enough time to go mad before each and every one of them died. There was hardly even time to scream. Millennia pass. The remnants of the Atlanteans devolve into ape-men and evolve into Cimmerians. They do not remember their Atlantean ancestry, but they know the temple is a place of divine beings, and call it the House of Crom, named after their chief god — though none go there. And somehow their culture remembers the notion that it is dire folly to pray directly to one’s chief god. Perhaps, in the distant past, a survivor of the Atlantean colonies stumbled upon the House of Crom and witnessed what lay within. Perhaps the lesson was so horrific it survived in their communal memory, scarred in bas-relief on the subconscious, locked away in the backwater of their animal brains surviving the eroding millennia of evolution. The House of Crom still stands. The ghosts of its builders still work—they are outside of time, do not even realize they are dead, just continue to toil. The Queen (the mother) is a sleeping beauty; as part of her ancient pact, she is preserved in endless slumber, escaping the knowledge of her horrible deeds in dreams. Her child (the son) still jabbers and wails in the Deep Cave with the dust and bones of the long dead handmaidens, and the key still sits in the treasury. The Outer God (the father) waits in the spaces between, for it is the Lurker at the Threshold. It does not devour the souls of the Atlanteans, but milks them of the energy they create with their perpetual toil and angst, feeds this nourishment to its son. Slumber preserves the Queen, the Queen anchors the souls of her people, and the people feed the child. The life cycle of such beings can take aeons, and the Little Prince is only in its pupa phase. When it is time, the Outer God will release its progeny upon the world. The House of Crom is an elaborate nursery for a tentacled messiah.